NEW DELHI, Aug 14  Listing various welfare schemes announced by the government recently for the soldiers wounded or killed in action, particularly after the Kargil conflict, Defence Minister George Fernandes said the Prime Minister had constituted a committee to bring about uniformity in the assistance given to soldiers by various state governments and form a national policy for the welfare of ex-servicemen. NEW DELHI, Aug 14  Congress President Sonia Gandhi and several senior leaders of the party today offered tributes to the Kargil martyrs who sacrificed their lives in defending the territorial integrity of the country. NEW DELHI, Aug 14  Putting speculation to rest, the Congress today decided to field former Lok Sabha Speaker and Union Minister Balram Jakhar from Sikar while renominating Mr Rajesh Pilot from Dausa and clearing Mr Buta Singh from Jalore in Rajasthan for the Lok Sabha elections. NEW DELHI, Aug 14  The Bahujan Samaj Party plans to contest only three of the seven parliamentary seats in Delhi in the forthcoming elections. NEW DELHI, Aug 14  The All India Anti-Terrorist Front Chairman, Mr Maninderjit Singh Bitta, today strongly opposed the governments decision to release eight Pakistani prisoners of war. NEW DELHI, Aug 14  A former Finance Minister and senior Congress leader, Dr Manmohan Singh, today filed his nominations for the prestigious South Delhi parliamentary constituency. He said the entire amount collected for the National Defence Fund and Welfare Funds of the three services after June 1 would be spent on the kin of soldiers killed or wounded in action. The ceiling of Rs 10 lakh assistance to the kin of the soldiers killed had been removed. Even the limit of assistance by the Central government had been raised to Rs 10 lakh. Uptil now there was no provision of financial assistance for soldiers rendered unfit for work because of injuries suffered in action but now such soldiers would be given a maximum of Rs 6 lakh each depending upon the seriousness of the injury. Wheelchairs, artificial limbs and motorised three-wheelers would be provided from the National Defence Fund (NDF). Also the entire expenditure would be borne by the NDF in case the soldier needed specialised treatment, either in the country or abroad. Artificial limb centres would be opened at Chandi Mandir, Lucknow, Guwahati, Delhi and Bangalore at a cost of Rs 10 crore. A Rs 5 lakh financial assistance would be provided to the family of each martyr or those wounded for house construction and Rs 2 lakh would be put in fixed deposit for childrens education and upbringing. The Defence Minister said some instances had come to notice in which the wives of martyrs received full assistance while the aged parents were left with nothing. Parents in need would also be given Rs 2,000 a month. The Defence Minister warned Pakistan of any further misadventure and assured that the government would do everything possible for the modernisation of the armed forces. In his message to the armed forces on the eve of the Independence Day, the Defence Minister said the armed forces were fully prepared to meet any challenge from across the border. He said India had given an appropriate response to Pakistani intrusions in Kargil and Pakistan would not dare to indulge in such a misadventure again. Pointing out that India would now always have to remain cautious of Pakistans intentions, Mr Fernandes said nothing would be allowed to come in the way of capability of the armed forces. He complimented the defence forces for their patient and successful handling of the Kargil conflict and said that entire world had appreciated Indias commitment towards world peace. "Every country knows that we dont want war but we believe in brotherhood. We want peace with our neighbours and Prime Minister Atal Behari Vajpayees Lahore bus journey was a step in that direction. Pakistan committed the mistake of misunderstanding it as our weakness for which it received a befitting reply." The government had always accorded top priority to the requirements for countering external aggression or internal disturbances. It was, however, regrettable that the proposal of proxy voting for the defence forces could not come through because of lack of consensus on the issue. The government was making consistent efforts in that direction. He said the armed forces had not only won the heights in Kargil, but also international opinion. The main reason for the international support was that the Indian forces had respected the sanctity of the Line of Control (LoC), despite grave provocations by infiltrators. "You clearly established during 'Operation Vijay' that real bravery and strength lies not in attack but in restraint." He also congratulated scientists and engineers of the DRDO, Ordnance Factories and other defence establishments for providing modern equipment to the defence forces. Describing as "without parallel in world history" the performance of Indian troops in 'Operation Vijay', the Defence Minister said a new chapter of bravery and patriotism had been added to the countrys history. He lauded the efforts of the forces in maintaining internal peace and in times of natural calamities like earthquakes, and floods. While citing the examples of Chamoli, Rudraprayag, Malpa, Gopeshwar and Okhimath tragedies, the role of the Territorial Army, the Border Roads Organisation, the NCC and the coast guard was also commendable. L/Hav Ram Kumar, (posthumous), Nk Kashmir Singh, (posthumous), Nk Ganesh Prasad Yadav, (posthumous), Nk Dev Parkash, L/Nk Gh Mohd Khan, (posthumous), L/Nk Khushiman Gurung, Sep Satpal Singh, Sep Tsering Dorjay, Dep K. Ashuli, (posthumous), Rfn Jai Ram Singh, Rfn Anusuya Prasad, (posthumous), Rfn Kuldeep Singh, (posthumous), Rfn Shyam Singh, (posthumous), Rfn Mehar Singh, Gnr Sajeev Gopala Pillai (posthumous), Wq Cdr Anil Kumar Sinhna, Sqn Ldr Ajay Ahuja (posthumous). Uttam Yuddh Seva Medal: Lt Gen Krishan Pal, Maj Gen Mohinder Puri, Brig Prakash Chand Katoch, Brig Amar Nath Aul, Satinder Singh Dhillon, AVM Jagnandan Kumar Pathania, AVM Narayan Menon. Bar to Sena Medal (Gallantry): Col Samir Kumar Chakravorty. Lt Kanad Bhattacharya, Sub A. Heni Mao, Sub Sumer Singh Rathore, Sub Joginder Singh, Sub Surender Singh, Sub Romesh Chand, Nb Sub Chanda Jat, Nb Sub Sunayak Singh, Nb Sub Tundup Dorje, Hav Shri Bhagwan, Hav Ranbir Singh, Hav Sarman Singh Senga, Hav Hari Om, Hav Ghulam Qadir, Hav Tam Bahadur Chhetri, L/Hav Ramesh Chandra, Nk Nirmal Singh Yadav, Nk Samunder Singh, Nk Ravi Karan Singh, Nk Karanbir, Nk Balwan Singh, Nk Bahadur Singh, Nk Ranjit Singh. Nk Jagat Singh, Nk Tashi Nurboo, Nk Mohan Lal, Nk Swara Singh, L/Nk Shakti Singh, L/Nk Narayan Singh, L/Nk Bhagwan Singh, L/Nk Kishan Singh, L/Nk Surman Singh, L/Nk Sarwan Singh, L/Nk Koshal Kumar Sharma, L/Nk Harish Pal, Sep Bhanwar Singh, Sep Surender, Sep Puna Ram, Sep Major Singh, Rfn Narpal Singh, Rfn Dabal Singh, Rfn Natinder Singh, Rfn Ajay Pathania, Rfn Sunil Kumar, Rfn Kewal Kumar, Gdr Munish Kumar, Gdr Kalyan Singh, Gdr Pravin Kumar, Gdr Raj Kumar, Gdr Udhyman Singh, Gdr Dalip Singh, Gnr Jagadish Prasad Gupta, Spr M. Jayavelu, Sigmn Vinod Kumar, Col Ldr Chhombe, Asst Ldr Tashi Phontsok. Vayu Sena Medal: Gp Capt Satish Pal Singh, Wg Cdr Raghunath Nambiar, Sqn Ldr Rajiv Pundir, Sqn Ldr Mohan Rao, Sqn Ldr Vishwas Gaur, Sqn Ldr Vanjay Bhatnagar, Sqn Ldr Gurcharan Singh Bedi, Sqn Ldr Dilip Kumar Patnaik, Sqn Ldr Ajai Prakash Srivastava, Sqn Ldr Alok Choudhry, Sqn Ldr Narender Singh Verma, Sqn Ldr Amanjit Singh Heer, Sqn Ldr Nitish Kumar, Sqn Ldr Harendra Pal Singh, Flt Lt Shreepad Tokekar, Flt Lt Rajesh Walia, Flt Lt Ashish Gupta, Flt Lt Subramaniam Muhilan, Flt Lt Gaurav Chibber, Flt Lt Kambampatti Nachiketa, Fg Offr Rajpal Singh Dhaliwal, 668396 Wo Krishan Singh Dhillon, 695490 Sqt Pasad Pilla Venkata Narayan Ravi, (posthumous) and 729917 Sqt Sahu Raj Kishore. NEW DELHI, Aug 14  Thirtyfive Border Security Force personnel have been awarded Presidents Police Medal for distinguished service and 31 Police Medal for meritorious service. Mr Kamalesh Deka (IG), Mr K.C. Sharma (Addl DIG), Mr A.K. Mishra (Addl DIG) and Mr K.B. Gurung (Commandant) were awarded the medal for distinguished service. Mr V.P. Sharma, Cmdt, Mr P.S. Jhala, Cmdt, Mr S.S. Ahlawat, Cmdt, Mr Virendra Kumar, Cmdt, Mr J.A. Khan, Cmdt, Mr S.K. Sharma, CMO, Mr R.L. Sharma, Cmdt, Mr Ashok Kumar, Astt Dir (Med), Mr G.S. Virk, DC, Mr Joginder Singh, Astt Cmdt, Mr C.L. Parihar, Astt Engr, Mr J.M. Sahgal, Astt Cmdt, Mr Prithviraj, DC, Mr K.K. Kapila (Subedar), Mr Umed Singh (Inspector), Mr R.P. Sharma (SI), Mr Hazur Singh (SI), Mr D.K. Basumatary (SI), Mr Grish Chand (SI), Mr R.L. Ram (HC), Mr Sukh Ram (HC), Mr Pratap Singh (HC), Mr Mangla Gogoi (LN), Mr Bachan Singh (constable), Mr L.B. Sarki (constable), Mr P.P. Sharma (LN), Mr G.R. Pillai (constable), Mr Gurmeet Lal (cobbler), Mr Shosha Ram (cook), Mr Shibo (washerman) and Mr Om Prakash (sweeper) have been awarded the medal for distinguished service. Thirtyone officers and jawans of the Central Reserve Police Force have been awarded Presidents Police Medal. Additional DIG, Mr P.J. Shetty, who is in the Directorate in New Delhi, and Additional DIG Balwant Singh at Group Centre, Gurgaon, have been awarded Police Medal for distinguished service. Mr Ratnakar Raman, Astt Dir, Mr S.M.Z. Rizvi, Astt Dir, Mr N.G. Subramania, Cmdt, Mr B.K. Sharma, Cmdt, Mr Devinder Singh, Cmdt, Mr Jagmehar Singh, Sec-in-Command, Mr O.P. Dagar,Constable, Mr S.D. Tripathi (D.C), Mr K. Babu, D.C, Mr A. Abdul Rahim, D.C, Mr B.S. Negi, D.C, Mr R S Singh, Astt Cmdt, Inspector Banna Ram, Inspector V.R.D. Kaimal, Inspector Narayan Singh, Mr R.L. Yadav (SI), Mr N.Yogidasan (SI), Mr Shanker Kishan (SI), Mr R.P. Sharma (SI), Mr Parbat Singh (SI), Mr Ghuman Singh (SI), Head Constable Ramanand, Mr James Kandolana (HC), Mr Ramanuj Ram (HC), Mr Balan Parambath (HC), Mr R.P. Maurya (HC) and Mr Devender Singh (HC) have been awarded the medal for distinguished service. Seventeen officers and other ranks of the Central Bureau of Investigation have been awarded Presidents Police Medal, three officers getting it for distinguished service and 14 for meritorious service. Mr Kailash Nath Tiwari, SP, Special Investigation Unit, Mr Baidya Nath Mishra, SP Multi-Discipline Monitoring Agency and Mr Mulinja Narayanan, SP, Special Investigation Cell have been awarded for distinguished service. Mr Harjit Singh Sandhu, SP, who is on deputation with the Interpol is among the 17 officers who have been awarded the medal for meritorious service. Mr Sandhu led the CBI team that raided the house of former Union Minister Sukh Ram which led to the sensational recovery of over Rs 3 crore in cash. The others include Mr D Boobathi Babu, DIG, Mr Harbans Singh, SP, Mr Baldev Singh Dogra, Mr Surendra Narain Saxena, Mr Ram Chandra Choudhary, Mr Mukesh Chandra Sahni, Mr Keshav Mishra, all DSPs, Mr K Murlidhar, Mr Ganesh Verma, Dy SP, Mr Raman Tyagi, Inspector, Mr Geroge Paulose, ASI, Mr Guman, Singh Head Constable, and Mr Istikhar Ahmed Khan (constable). NEW DELHI, Aug 14  Seventeen officers of the Delhi Police have been awarded police medals on the eve of Independence Day. While the Assistant Commissioner of Police, Mr R.K. Joshi, has been awarded Presidents Medal, the other officers, including the Deputy Commissioner of Police, Mr Shankar Dash, the Assistant Commissioner of Police, Mr Satyendra Nath, the Assistant Commissioner of Police, Mr Ramesh Kapoor has been awarded Police Medal for meritorious services. Following is the list of the awardees: ACP, Ravi Shankar, Inspector Data Ram, Inspector Raghubir Singh Anand, Sub-Inspector Som Dutt, Sub-Inspector Sudershan Singh, Sub Inspector Girish Chander Joshi, Assistant Sub Inspector Thankachan Jose, Head Constable N. Selva Raj, Head Constable, Ram Chander, Constable Dharam Rajan and Constable Sudam Singh. Following is the list of officers of the Industrial Security Force: Mr V.R. Sampath, Mr P. Jagannathan, Mr P.K. Kaushlappa, Mr D.S. Mahla, Mr K. Gopalakrishnan, Mr G.R. Nayar, Mr C.R. Acharya, Mr B.K. Gain, Mr T.K. Sivadasan, Mr T.K. Banerjee, Mr T.K. Ghosh, Mr P.D. Nautilya and Mr P.K. Krishnan. The Congress central election committee tonight released a list of 51 candidates which includes Mr Kaul Singh Thakur for the Mandi Parliamentary Constituency in Himachal Pradesh. The candidates for three of the four seats were announced earlier. While the CEC allowed Mr Jakhar to shift from Bikaner, it renominated the Rajasthan PCC chief Girija Vyas from Udaipur and brought in the Indian Youth Congress vice chief, Mr Jagat Singh, to contest from Bharatpur, a seat held by his father Mr K. Natwar Singh. In Gujarat the CEC decided to field former Chief Minister Shankar Sinh Vaghela from Kapadvang and in Meghalaya pitted Mr Atul C. Marak against former Lok Sabha Speaker Purno A. Sangma of the Nationalist Congress Party in the Tura Lok Sabha constituency. The AICC also announced a list of candidates for Assam, Arunachal Pradesh, Meghalaya, Manipur, Nagaland, taking total number of candidates to 176 so far. NEW DELHI, Aug 14  The Bahujan Samaj Party (BSP) plans to contest only three of the seven parliamentary seats in Delhi in the forthcoming elections. Having nominated candidates for the East and Outer Delhi seats, the party leadership is likely to nominate Mr Ram Swaroop Bhairwa from the Karol Bagh reserved constituency. Sources in the party said Mr Bhairwa is contesting elections for the first time. In the last Lok Sabha elections, the BSP contested all seats except Chandni Chowk. It fielded Chaudhary Sahattan for the Karol Bagh reserved constituency. NEW DELHI, Aug 14 (PTI)  Congress President Sonia Gandhi and several senior leaders of the party today offered tributes to the Kargil martyrs who sacrificed their lives in defending the territorial integrity of the country. Mrs Gandhi, Congress Working Committee members Manmohan Singh, Ahmed Patel, R.K. Dhawan, Ghulam Nabi Azad, Oscar Fernandes and senior party leaders Shivraj Patil and G. Venkataswami offered their tributes at Amar Jawan Jyoti at India Gate. 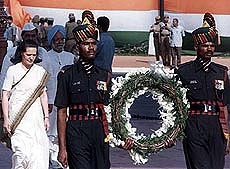 Mrs Gandhi placed a wreath in the memory of Kargil martyrs at the Amar Jawan Jyoti. Delhi Chief Minister Shiela Dikshit, DPCC president Subhash Chopra and AICC Secretaries Maj Ved Prakash and Maj Dalbir Singh were also present. The leaders took out a peace march from 30 January Marg (Bapu Dham) to India Gate which was received by Mrs Gandhi there. NEW DELHI, Aug 14 (UNI)  The Radio and television networks are to bind the nation tomorrow evening in a unique manner with a single thought: To pay a tribute to the martyrs who fought for the freedom for the country, and to those who laid down their lives protecting that freedom. Envisioned and directed by G. Bharat, known as Bharatbala for his Vande Mataram series, the programme Desh Ka Salaam produced by maestro A. R. Rehman will be broadcast from 8 p.m. to 8.10 p.m. on Sunday by All India Radio, Doordarshan, and all cable and satellite TV networks in the country. Produced by maestro A. R. Rehman, it will consist of two different renditions of the national anthem Jana Gana Mana involving about 50 renowned musicians and artistes, following by a special rendition of the moving aie mere watan ke logo by the singing nightingale, Lata Mangeshkar. Apart from this, Doordarshan will telecast on its national channel (DD one) tomorrow at 7.30 p.m. a unique film: A programme on the evolution of Vande Mataram from its first being written as part of the novel Anand Math by Bankim Chandra Chattopadhyaya in 1874 till its adoption by the Constituent Assembly as the national song on January 24, 1948. The coverage of the countrys 52 Independence Day will have a different tone as the country has just come out of one other major threat to its freedom. This is bound to be reflected in the various programmes that are being broadcast by the electronic media. For Doordarshan, the day will also mark a new chapter as it will mean not only entering a round-the-clock satellite telecasting era, but also launching a full-time news channel. As usual, both All India Radio and Doordarshan will give live coverage of the flag hoisting by Prime Minister Atal Behari Vajpayee from the ramparts of the historic Red Fort. These will be broadcast on all primary channels of AIR and telecast on all Doordarshan channels including the primary channel (DD one), Metro Channel (DD two), DD Sports, and DD India (International). Programmes of patriotic songs will also be telecast on DD one and DD India, which will also carry a special programme on Independence day tomorrow night. Various TV channels are also screening patriotic feature films to mark the occasion. Doordarshan will telecast the Mani Rathnam film Roja set against the backdrop of the militancy in Jammu and Kashmir, while Sony will telecast Border directed by J. P. Dutta which won major awards two years ago. The Hinduja-owned cable video opera will telecast the Chetan Anand Haqeeqat, which is still one of the best war films ever made in India. AIR has also scheduled several other programmes on its national hook-up. Shehnai maestro Ustad Bismillah Khan will present a recital tomorrow night at 10 p.m. and there will be an interview-based feature at the same time on August 19 entitled Ek Sadi Ka Safar: Safar Azadi Ka written by Dr Kanhaiya Lal Nandan and presented by Virendra Gohil. A unique feature about the Desh Ka Salaam is that all satellite television networks will get the cast from Doordarshan which will uplink it to the Pas four and Insat satellites. The programme from 8 p.m. will also be available on a website, www.deshkasalaam.com being created only for these 10 minutes. In addition, about 500 cinema houses are expected to play the national anthem at the commencement or conclusion of a show. According to Bala, who over the past two years has popularised Vande Mataram as a modern Indian chant, the programme, which was shot in Ladakh, will have three segments: about 50 maestros and musicians playing the Jana Gana Mana in a symphonic ensemble, followed by Hindusthani and Carnatic rendition of the national anthem by different artistes. It will conclude with the voice of Lata Mangeshkar. NEW DELHI, Aug 14  The All India Anti-Terrorist Front Chairman, Mr Maninderjit Singh Bitta, today strongly opposed the governments decision to release eight Pakistani prisoners of war (PoWs). Such a step should not be taken unless Islamabad reciprocates and releases the Indians detained in Pak jails since 1965, Mr Bitta said. The eight Pakistani PoWs held captive during the Kargil conflict were being released by India as a goodwill gesture. The PoWs were Naik Inayat Ali of 5 Northern Light Infantry, Sepoy Fazal Aman of 24 Sind, Sepoy, Hunar Shah of 5 NLI, Sepoy, Mohammad Ayaz of 4 NLI (attached with 5 NLI), Sepoy. Sher Baz Khan of 5 NLI (att.) Sepoy, Ahmed Khan of 33 FF and Sepoy Salikh Khan of 19 PoK Battalion. Mr Bitta stated that India had always acted with a sense of goodwill but without any positive response from Pakistan. Despite repeated efforts by the Indian Government, Indian PoWs of the 1965 and 1971 wars were still languishing in Pakistan jails. India, he added, had released more than 90,000 Pakistani PoWs in the wake of the Bangladesh war when Mrs Indira Gandhi was the Prime Minister. But what we got in return from Pakistan was betrayal, he said. Mr Bitta, a former Indian Youth Congress President, asked the Pakistan Government to admit before the international community that they had pushed army regulars into the Indian territory along with infiltrators during the recent Kargil conflict. He expressed concern over the recent stepped up ISI activities in India and revamping of terrorist training camps by Pakistan along the Indian border. All such criminal activities of Pakistan should be brought to the notice of the international community, he said and demanded immediate extradition of militants in asylum in Pakistan. The samiti also submitted similar memorandum to five permanent members of the Security Council. A memorandum highlighting the demands of the Kashmiri people has also been submitted to the major political parties. The samitis demands include setting up of a commission under an eminent jurist to investigate and inquire into the reasons that the terrorist incursion in Kashmir in 1989; determined and definite plans to rehabilitate the minority community; all Kashmiri Pandits living anywhere in the country and abroad be declared as displaced persons under various UN conventions and the government should start registration of Kashmiri Pandits residing outside Kashmir as displaced persons. Dr Manmohan Singh, who filed four sets of nomination papers, would be contesting the Lok Sabha elections for the first time. The last date for the filing of nominations is August 18. Other prominent persons who filed the nominations were the two BJP candidates, Dr Vijay Kumar Malhotra from South Delhi and the sitting MP Mr Lal Bihari Tiwari, from East Delhi. Dr Manmohan Singh is the first Congress leader to file the nomination papers. Delhi has seven Parliamentary constituencies. While the BJP has announced the names of the candidates for all seats, the Congress has so far announced three candidates -Mr R.K. Dhawan from New Delhi, Ms Meira Kumar from Karol Bagh and Dr Manmohan Singh. The seven BJP candidates are Dr Vijay Kumar Malhotra from South Delhi, Mr Lal Bihari Tiwari from East Delhi, Mr Sahib Singh Verma from Outer Delhi, Mr Madan Lal Khurana from Sadar, Mr Vijay Goel from Chandni Chowk, Ms Anita Arya from Karol Bagh and Mr Jagmohan from New Delhi parliamentary constituency.